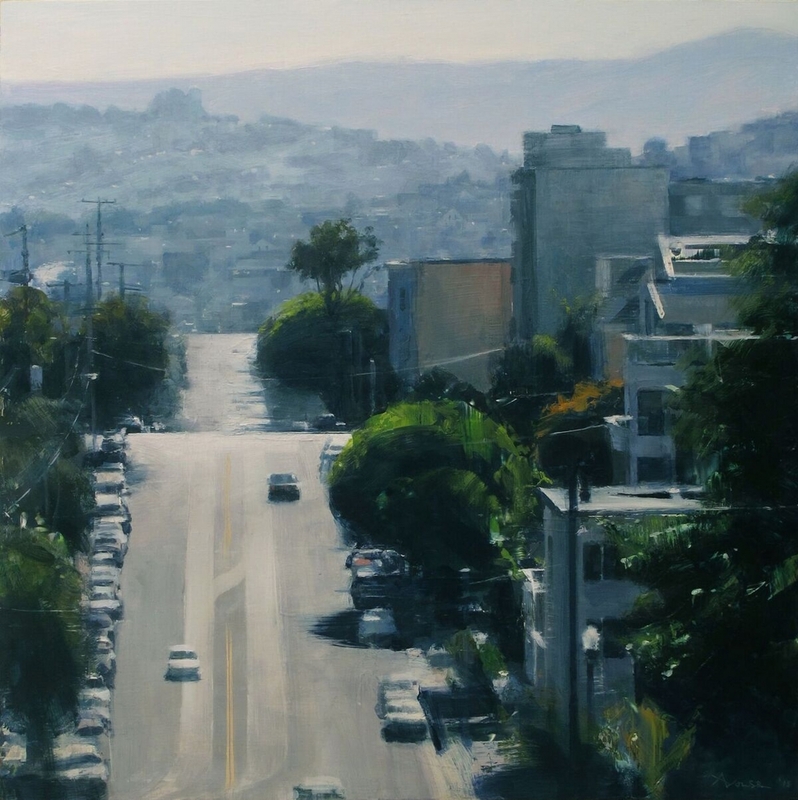 Jenkins Johnson Gallery San Francisco is excited to present “Distilled Realities,” a solo exhibition of Ben Aronson’s vibrant, atmospheric cityscape paintings of San Francisco, New York, Chicago, Paris, and Rome. Synthesizing the gestural energy of emotionally charged abstract expressionist brushwork, influenced by Richard Diebenkorn, with the observational precision of contemporary realism, Aronson’s new, psychologically arresting paintings land for a dynamic fifth solo show at the gallery. This, Aronson says, creates “a personal shorthand which serves to deepen and intensify our emotional connection to the work.” With this shorthand, Aronson creates paintings that speak to the particular evocative ethereal nature of pausing for a moment to look at the city as it moves around you. Through the haze of fog, the blurring of blues in the sky, the moving of leaves in the wind, Aronson’s language is distinct and intoxicating. With loose painterly strokes and a deft rendering of atmospheric light, fleeting and familiar moments of cars breezing by and the afternoon sun casting long shadows onto the road materialize in visual poetic verse. Building from studies created en plein air, Aronson’s specificity and attention to light and shadow transport his viewer to a precise location and an exact moment in time, from early morning in the Hollywood Hills to late afternoon in SoHo. Foundational to Aronson’s work is his innate ability to capture light, and the ways in which light varies between and within the cities he visits. Aronson’s diversified use of light and color demonstrates his range in depicting cities and neighborhoods with specific atmospheric moods.